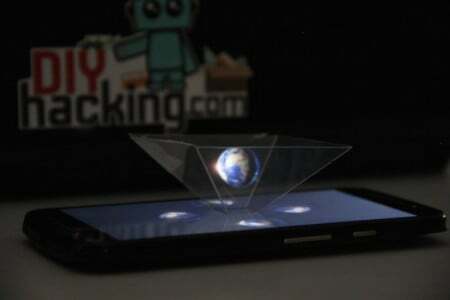 Make this simple device to watch hologram videos on your smartphone or tablet. Have you wanted to do a DIY project at home for a long time but have been procrastinating? This project is as simple as it gets. So get off that couch and MAKE! 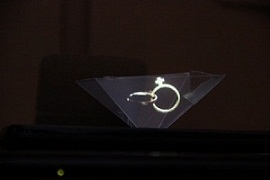 How Does the 3D Hologram Pyramid Work? 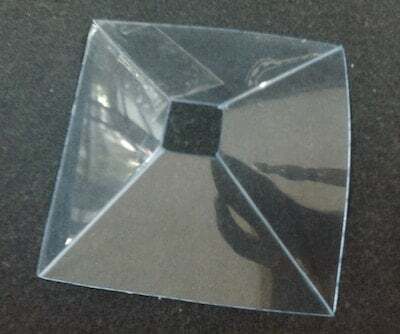 The DIY hologram pyramid is a simple device that can be made by manipulating a sheet of plastic into the shape of a pyramid with its top cut off. 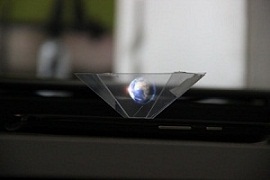 The device creates a 3D-like illusion for the viewer and makes an image or video appear as if it were in midair. It works on the principle of Pepper's Ghost. Four symmetrically opposite variations of the same image are projected onto the four faces of the pyramid. By principle, each side projects the image falling on it to the center of the pyramid. These projections work in unison to form a whole figure, which creates a 3D illusion. 1. Print out the template shown below on a sheet of A4-size paper. NOTE: If you do not have access to a printer, you can also make a template on your own. 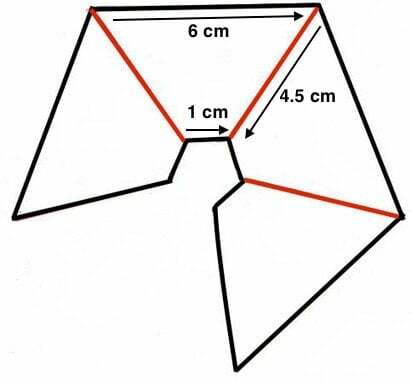 Draw a basic "Trapezoid" on a piece of paper using these dimensions. Parallel sides= 1cm, 6cm & other two sides= 4.5cm each. You can always double or triple the dimensions in proportion to use on a larger display. 2. Trace out the shape on the plastic sheet using a ruler and pen. For the trapezoid template, trace out four similar outlines on the plastic sheet. Now carefully cut out the outlines with a cutting blade and ruler. Try to make your cuts as precise as possible for a perfect pyramid. 3. If you used the printout template: Score the red edges very lightly using a cutting blade. This will allow you to fold the edges better and form a pyramid shape. Stick the open edges of the sheet together using clear cellotape. If you used the trapezoid template: Join the four edges to form a pyramid shape. Stick them together. Either way, in the end you will have a pyramid like the one shown below. 4. That's it! You have made yourself a hologram pyramid! 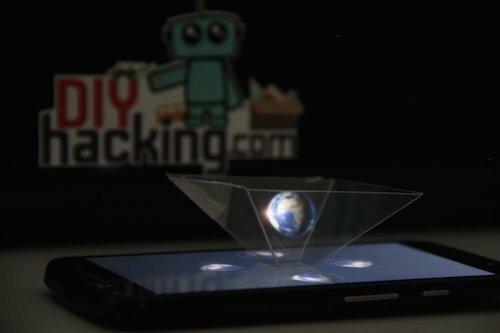 All you have to do now is play a hologram video in your phone. 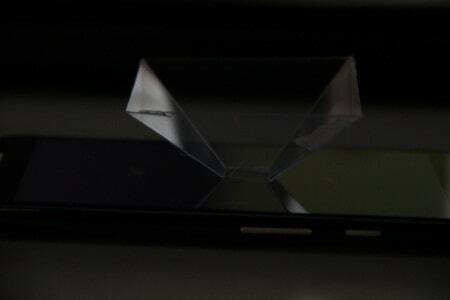 Place the hologram pyramid in the middle of your screen, like shown in the image below, and enjoy the show. Don't forget to switch off the lights in the room before you start playing the video. You can find plenty of hologram videos on YouTube. We had a bit of fun with our pyramid, and you can see the pictures and video below!